Set the Access Key ID and Secret Access Key in Dada Mail. Amazon Simple Email Service (Amazon SES) is a cost-effective email service built on the reliable and scalable infrastructure that Amazon.com developed to serve its own customer base. With Amazon SES, you can send and receive email with no required minimum commitments - you pay as you go, and you only pay for what you use. 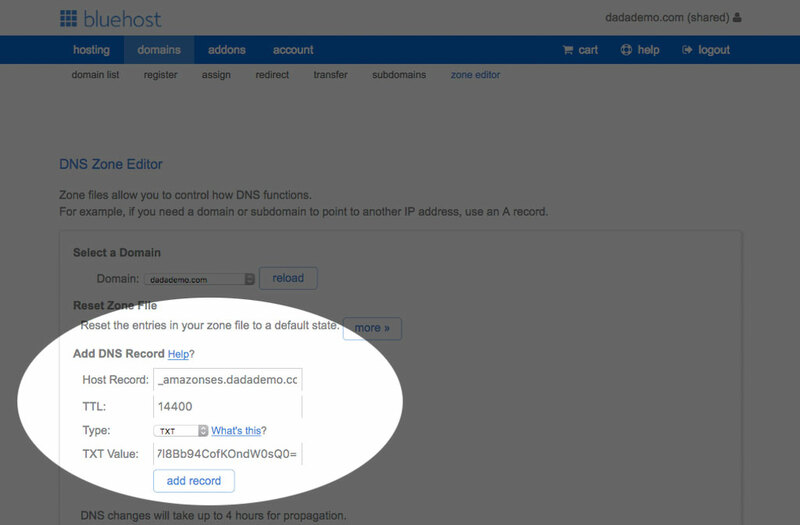 Dada Mail can utilize Amazon SES to send out email both by using the Amazon SES API, as well as using the Amazon SES SMTP gateway. 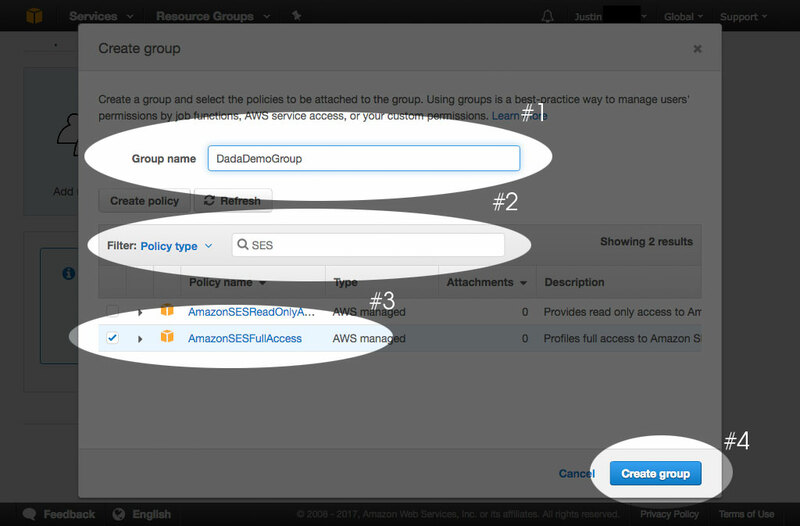 Amazon SES is one solution to a problem faced by many people on shared hosting accounts who are faced with the problem that they are sending out too many messages, too quickly for the amount of resources available to them. for current pricing. Using the service in a testing, non-production mode is free. Our services for installing and configuring Amazon SES for your Dada Mail is a one-time fee. Since Amazon SES is an outside, third party sending service, you'll need to use a mailing list that's 100% confirmed opt-in. If you don't, complaints of abuse sent to Amazon will most likely disallow you from continuing to use their service. When you use Dada Mail with SES, Dada Mail will set the Return-Path header explicitly. Dada Mail's included Bounce Handler has rules specifically for Amazon SES, and we do highly suggest using it, if you use Amazon SES, to comply with their terms of services. 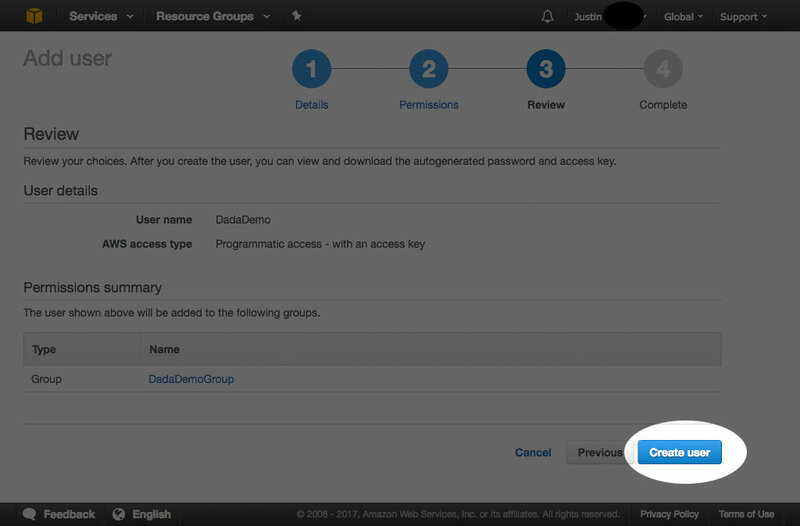 During installation of Dada Mail, you'll need to choose the AWS Region/Endpoint you would like to utilize, then paste in your AWS Access Key ID and AWS Secret Access Key. Setting up things on the Amazon AWS side of this equation is a little more involved. We will describe the process below. Later, we'll also describe how to set up Dada Mail just to use Amazon SES's SMTP gateway, which does not require you to set up an IAM User and configure the AWS Region/Endpoint, AWS Access Key ID, and AWS Secret Access Key into Dada Mail's configuration. You'll simply need to add the SMTP server, username and password to Dada Mail, like you would for any SMTP Server. You'll be asked to create a new Amazon account and give Amazon your payment information. For the SES service, there is no upfront cost: you are only billed for what you use. We will need to create a new IAM user and add that user to a group that has full access to the SES service. On the top bar, click on your name (my name is Justin in this walkthrough), and select, My Security Credentials. Click, Users (#1) on the left hand menu, then, Add User (#2) at the top of the screen. Under, User name Enter a user name (#1). In this doc, I'm going to enter DadaDemo. Under, Access type, select, Programmatic access (#2). Then, click the button labeled, Next: Permissions (#3). 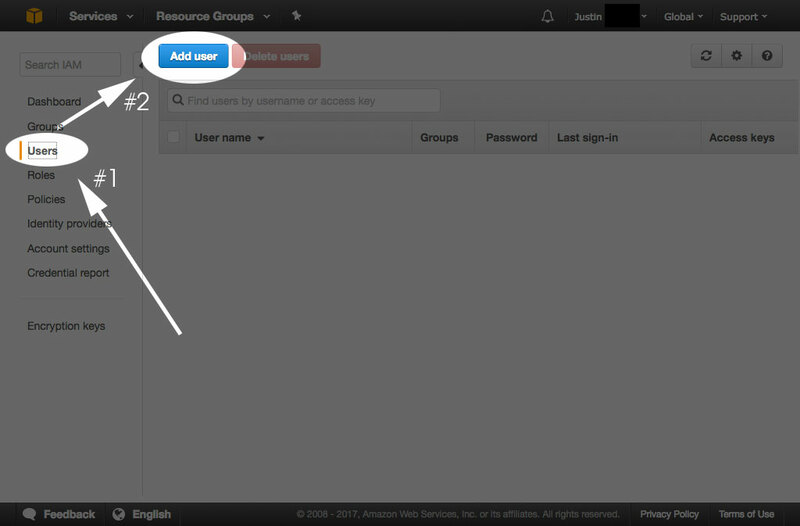 Click the button labeled, Create group. A modal window will be revealed. Under, Group name, enter a group name. (#1). In this doc, I'm going to enter, DadaDemoGroup. Click the button labeled, Next: Review. Click the button labeled, Create user. 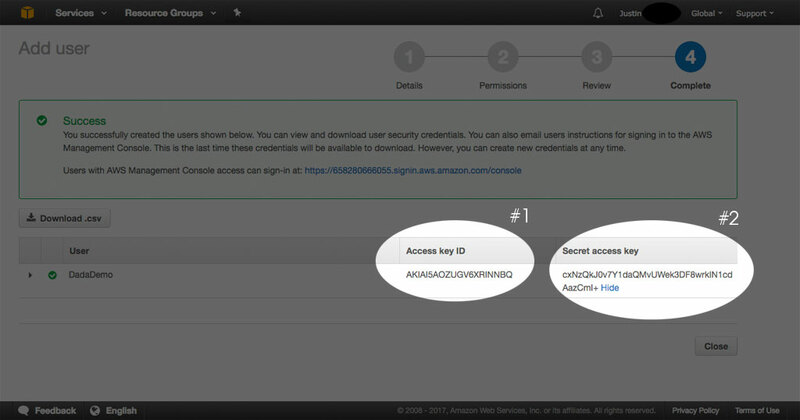 Copy both the, Access key ID (#1) and, Secret access key (#2) and set them aside in a safe place - we'll use them later. In the Dada Mail Installer, click the button labeled, Show/Hide Advanced Options, then check the checkbox labeled, Configure Amazon SES. Textboxes to paste in the Endpoint, Access Key ID and Secret Access Key we just retrieved will be revealed. 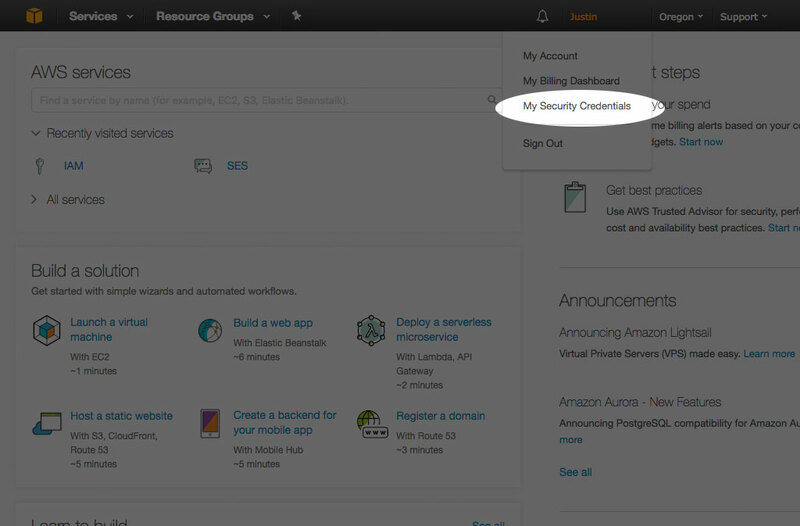 Paste in those two keys, and test them by clicking the button labeled, Test Your AWS Credentials. We'll talk about endpoints a little later, when we talk about Production Access. If the credentials work, you'll be told what your current sending quota is. (using your own Access Key ID and Secret Access Key). 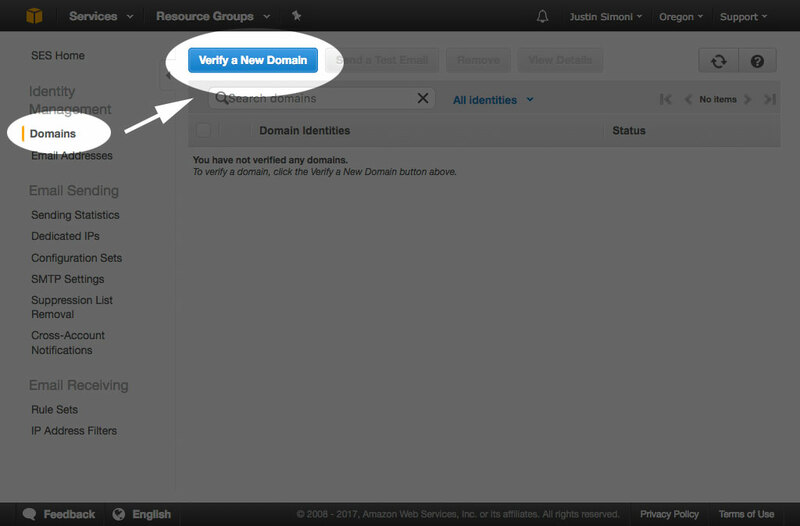 Verifying a Domain with Amazon SES allows you to use any email address belonging to that domain that you would like for your List Owner and List Admin. 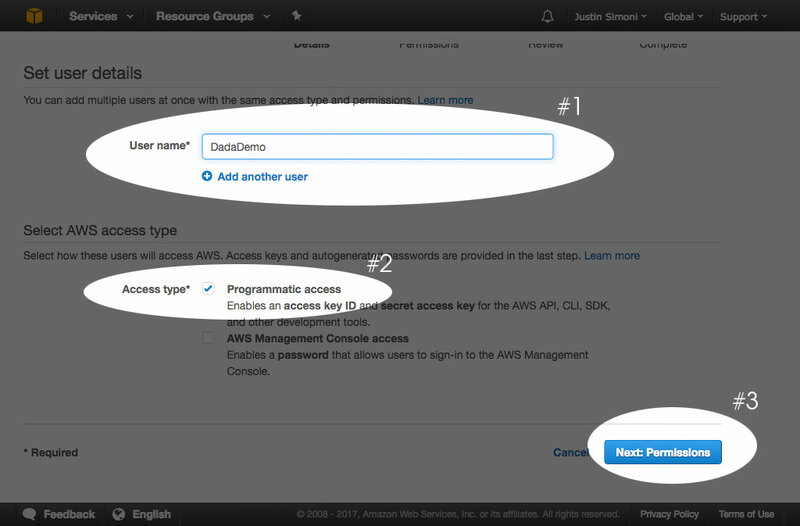 To verify a domain, sign back into your AWS console. AWS has the idea of Endpoints, so you want to make sure you do all of the following work on the same Endpoint that you've set up Dada Mail to utilize. In this doc, we're using the, US West (Oregon) endpoint. On the left hand menu, click the, Domains link, then click the, Verify a New Domain button. A modal menu will be revelaed. Under, Domain enter the domain you would like to verify (#1). Also make sure to check the, Generate DKIM Settings checkbox (#2). In this doc, we're using, dadademo.com as our domain. A series of TXT and CNAME records will be created for you, and AWS will monitor your DNS records to see if those records are set up. Once they are, your domain will be verified. Click the link labeled, Download Record Set as CSV to download the DNS records you need to set up. Then, we would click the add record button. Under Type, select CNAME and not TXT. If everything is successful, the domain will then be verified. 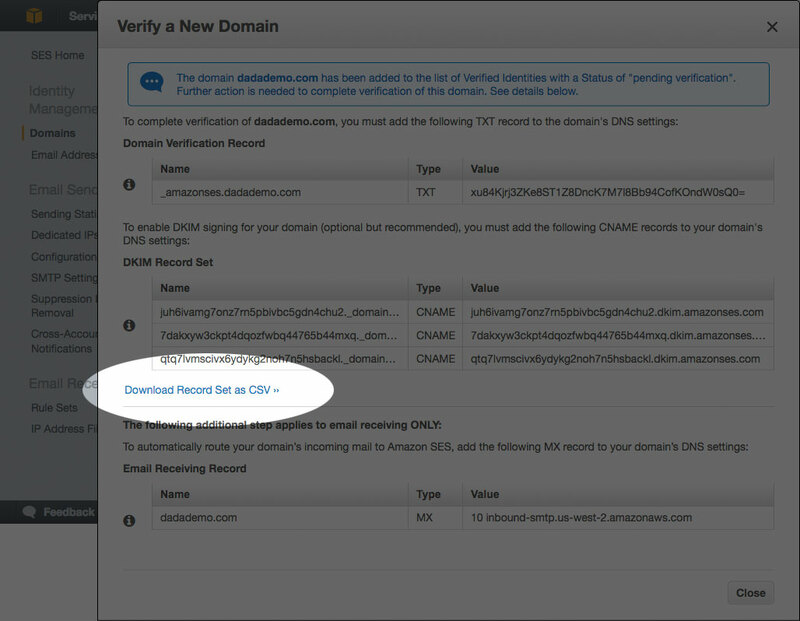 You can test to see if the domain is verified back in the Amazon AWS Console. 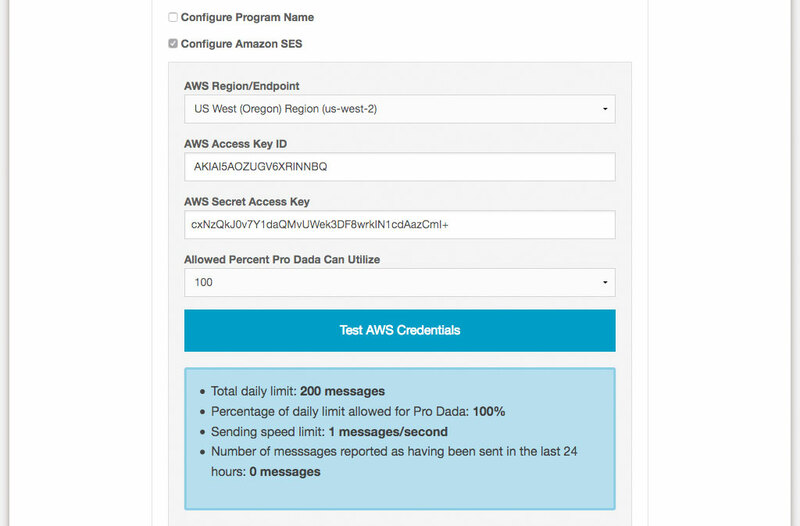 Once the AWS Endpoint, Access Key ID and Secret Access Key are configured in Dada Mail, you may then set up a mailing list to use SES for sending. If you haven't already, you'll need to also Verify each sender that'll be using the service. Once you've verified a domain, all addresses under that domain may be used. Any other address will need this verification. 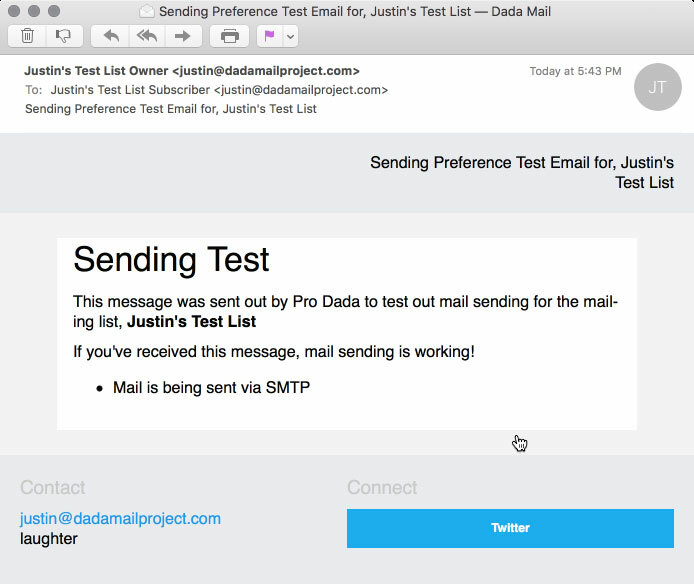 For Dada Mail, that means verifying the List Owner, and if you're using the Bounce Handler (which you should! ), the List Administration email address. Under Amazon SES Tools fill in your List Owner's email address, and click, Verify. That email account will receive an email message from Amazon AWS, with a verification link to click to finish the verification process. Click the button labeled, Verify a New Email Address to get started. When using SES for mail sending in Dada Mail, it's important to keep below the sending quota set by Amazon SES. This limit can fluctuate - usually upwards, while you use the service. 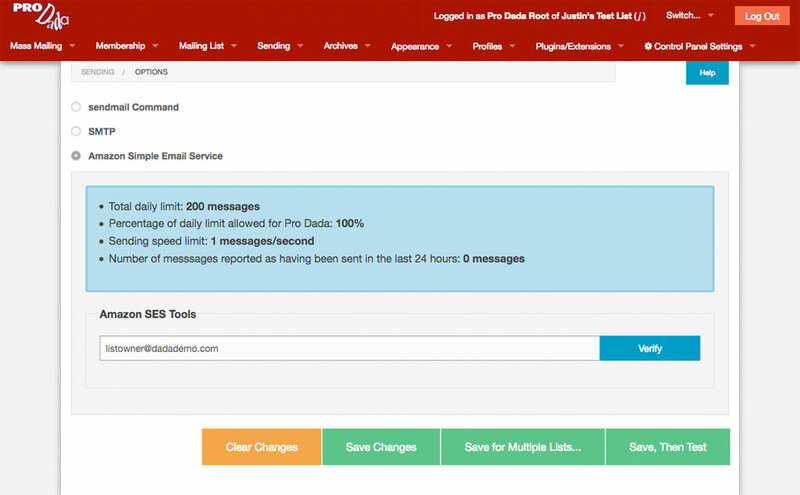 To make things easier, Dada Mail can be set to automatically adjust its Batch Settings to work within your limit. 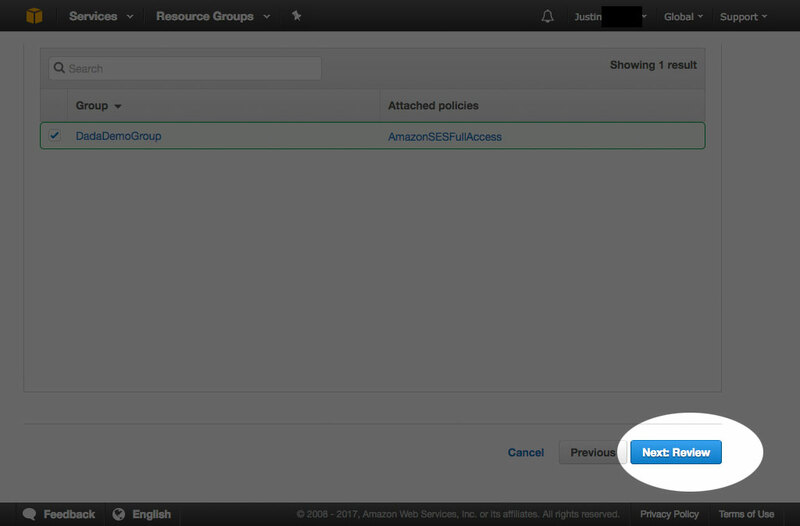 Your batch settings will now grow or shrink, depending on your current Amazon SES sending limits. If you do go over your total 24 hour quota, mass mailings will not be sent out, and batches will be set to wait for 5 minutes, before trying to be sent again. When your 24 hour quota is lifted, sending will once again take place. For the most part, Dada Mail will attempt to aggressively keep your batch sending speeds high, until you start coming near your daily mail quota set by SES. When that happens, batch sending speeds will creep lower, to accomadate your limits. At no point should Dada Mail send either faster than it should, either by going over the limit per second limit, or the 24 hour limit. Your SES sending limits themselves should creep up, as you use the service. Keeping the mass sending rates high will show the Amazon AWS system that you're utilizing the system, and they're most likely going to want to raise the limit for you, without further intervention. Rather than using the API, you can use Amazon SES via its SMTP Gateway. There's a few downsides: if you don't set up a IAM user, you won't get automatic batch settings, sending statistics, and you can't verify a sending witin Dada Mail. Mass mailing may not be as fast. The advantage may be that it's easier to set up. First, sign into your AWS console. Click, SMTP Settings on the left hand menu. Your SMTP Credentials should be ready to be utilized! Click the link labeled, Show User SMTP Security Credentials to reveal your SMTP credentials. The SMTP Username and SMTP Password will be revealed. Copy both these values. In Dada Mail's List Control Panel, go to: Sending: Options. 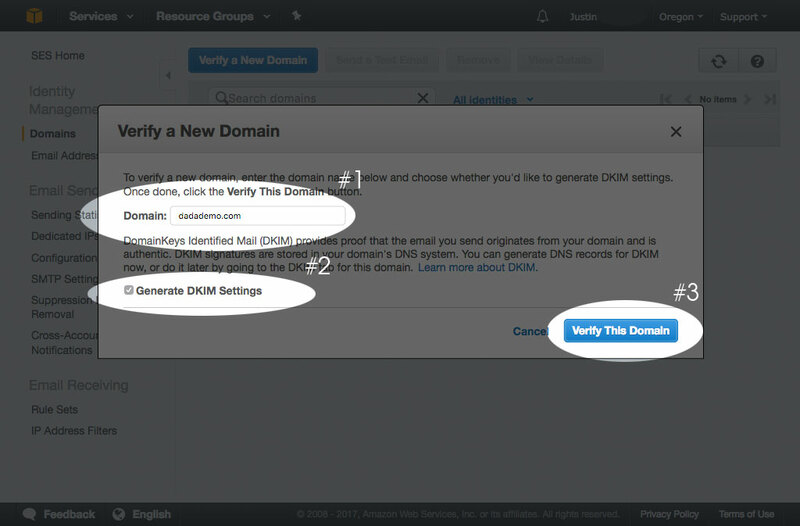 Select SMTP (and NOT Amazon Simple Email Service) and fill out the SMTP Server. 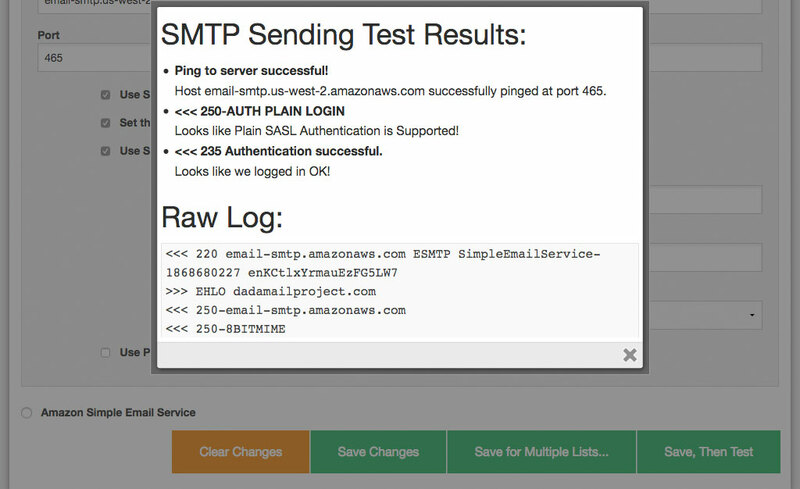 For this demo it's: email-smtp.us-west-2.amazonaws.com. and fill in the Username and Password with what we just created. Without full production access, you'll only be able to send messages to addresses that have been manually verified. When requesting production access, you'll be asked a few different questions - make sure to take your time and answer these questtions thoughtfully, as someone will check that your answer comply with the AWS and SES terms of service. Remember we set our region to use, US West (Oregon), so that's what we'd set up here, too. This could be any number, really, but by default (and as I type this), Amazon SES will give you 50,000 messages you may send out per day by default when you ask for Production Access. This will actually be different, depending on how you use Dada Mail. Take your best guess. Most likely, this also means you've set up the Bounce Handler in Dada Mail! This, I feel, is the most important field to fill out. You will want to describe how you intend to use the Amazon SES service. Some strong points you will want to consider communicating is that your mailing list only has subscribers that have been verified, that you follow ALL best practices for sending out mass mailing, and you have in place ways to deal with bounced messages and complaints. You may even want to mention you're using Dada Mail to help handle all this! Once the form is submitted, it'll take approx. one day to get an answer via email. Once you do get a positive answer, you're ready to use Amazon SES in production. Hurray! Sending via Amazon SES is done with a persistent HTTP connection, so performance should be pretty good!. 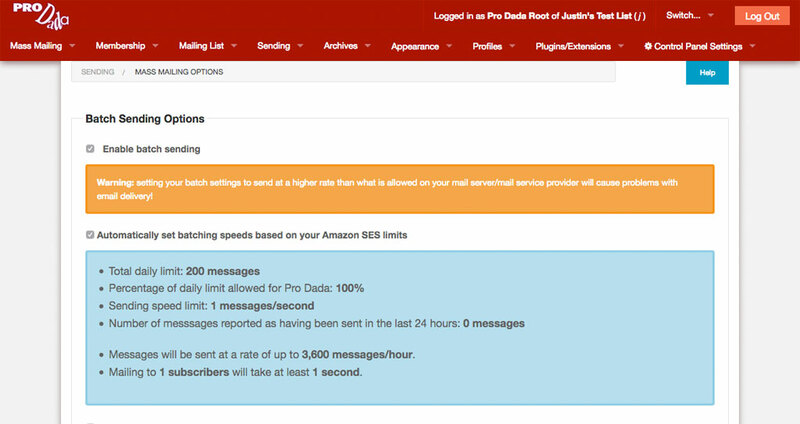 Expect around .3 seconds/message for just passing the email message from Dada Mail to the Amazon SES service. Along with the List Owner and List Administration address, be sure to verify the, List Email address with Amazon SES. The, Message-ID header will be sent as the, X-Message-ID header. The, List header will be sent as the, X-List header. 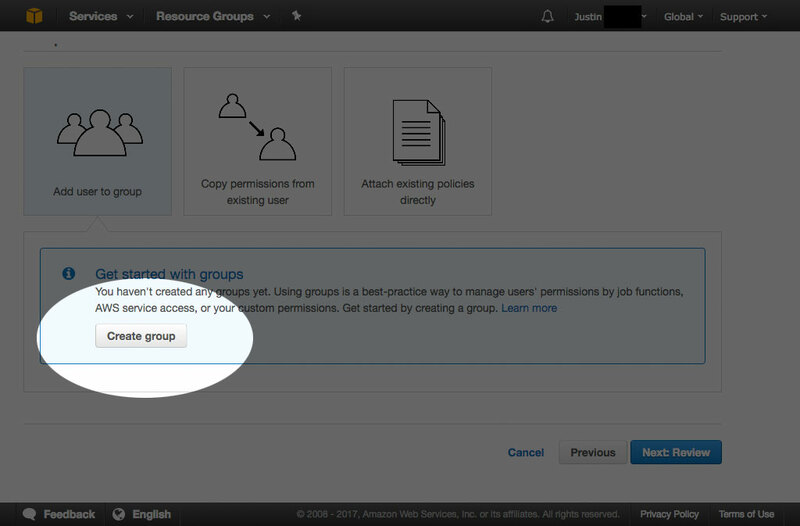 Email headers that are not supported by Amazon SES are automatically not sent out. Installing, Bundle::DadaMail alone will install all of the above modules. See also the FAQ, How do you install, "CPAN Perl Modules"